This isn’t the first time fluoridation has been proposed in Portland. 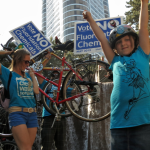 Three times in the last 56 years Portlanders have rejected fluoridation of Bull Run tap water. Fluoride proponents have repeatedly argued that since chlorine is added to drinking water, adding fluoride chemicals should be acceptable as well. However, chlorine is added to remove bacteria and make our water potable, not as a form of medication. In this case, fluoridation is being marketed as the prescription to provide ‘dental equity’. But what about the issue of consent? And what about those people who have prior conditions that would make them especially susceptible to a bone-damaging fluoride overdose called skeletal fluorosis? The argument could be made that in some circumstances, compulsory medication is warranted. Vaccinations for highly contagious, life-threatening diseases like smallpox are a good example of when such a policy makes sense. This cannot be argued for fluoridation. Cavities are not, and never will be contagious. Can we then honestly say that mandatory ingesting of fluoride in our drinking water without consent is ethical? Many organizations are also concerned with how accumulated fluoride effects our soil and waterways. Recently, Food & Water Watch, the Columbia River Inter-Tribal Fish Commission’s executive director, Columbia Riverkeepers, and the local chapter of Sierra Club all articulated their opposition to fluoridation. Fluoridation proponents cite the fact that some tap water contains trace amounts of naturally occurring fluoride as proof that adding more is safe. However, fluorosislic acid is not the same as naturally occurring fluoride. Fluorosilicic acid is actually an industrial byproduct of fertilizer production. We’ve been told that people of lower income and minorities are at a higher risk of tooth decay. While this may be true, many people of color are also at risk for other health issues that fluoridation could worsen. Last month, the local chapter of the NAACP chose to formally oppose fluoride as well. Proponents claim there is scientific consensus about fluoridation in the United States, however, the vast majority of European nations do not add fluoride to their drinking water due to health and environmental concerns. Just last month, the health minister of Israel decided to end the practice of mandatory fluoridation over similar safety concerns. There are smarter, more responsible ways to achieve dental health. Fluoridation is a potentially risky, nonconsensual practice. With so much doubt and division within our community over an issue of such importance, the ethical choice is clear. Portland deserves better. Please vote NO to fluoridation. Ballots are due by May 21st. Original images copyright Hart Noecker and Rebel Metropolis. FOIA requests are used by antifluoridationists to imply that there is some hidden information that must be pried free of secrecy. There isn’t. The information sought by antifluoridationists through FOIA, is usually that which is readily available to anyone who goes through normal channels to obtain it. Because antifluoridationists are too impatient to wait until such information is completed and available, or that they simply have no idea as to how to properly obtain public information without shouting, whining, and demanding……is a problem with these activists, not an indication of conspiracies. Countless peer-reviewed scientific studies have clearly demonstrated the effectiveness of fluoridation. I will gladly cite as many as anyone would reasonably care to read. There is no “medication” involved in fluoridation. There are simply fluoride ions identical to those which have existed in water forever. Fluoridation does nothing but raise the level of those existing fluoride ions by a minuscule amount up to the optimal level at which dental decay prevention will occur with no adverse effects. There is no “marketing” or “prescription” involved in fluoridation. It is simply a very valuable public health initiative which has undergone relentless attacks from activist zealots since its very beginning 70 years ago. In spite of these attacks this initiative has grown through the years to the point where the United States is now 74.6% fluoridated. Anyone who demands “consent” for fluoridation is demanding it of themselves. Informed consent is a concept utilized in regard to treatment administered. As individuals “administer” fluoridated water to themselves, then any “informed consent” would be from themselves to themselves. Obviously, “informed consent” in regard to water fluoridation, is utterly nonsensical. Individuals are free to drink it or not. Their choice. There is no valid, peer-reviewed scientific evidence of any “prior conditions” resulting in skeletal fluorosis attributable to optimally fluoridated water. Skeletal fluorosis is so rare in the 74.6% United States as to be nearly non-existent. With hundreds of millions of people having ingested fluoridated water over the past 7 decades, if skeletal fluorosis was in any manner attributable to optimally fluoridated water, this disorder would be rampant in the US by now. “Compulsory medication” is irrelevant to water fluoridation. There is no “medication” and no “compulsory” involved. Again, any question of “consent” is nonsensical in regard to fluoridation. As each individual “administers” fluoridated water to him/herself, the only consent would be an individual providing it to him/her self prior to “administering” fluoridated water to him/her self. The “Sierra Club”, the “Columbia Riverkeepers”, and Paul Lumley, are certainly welcome to their opinions. However, these opinions are uninformed, and in contradiction to the peer-reviewed science which has clearly demonstrated that there is no adverse effect on the environment from optimally fluoridated water. This is nothing but pure ignorance of the science of fluoridation. Unfortunately, such ignorance is prevalent with antifluoridationists and their groups. First of all, most groundwater contains fluoride generally in the range of 0.1 ppm to 0.3 ppm, some has less, some has more, some has much more. As groundwater flows over ricks, it picks up fluoride ions leached from calcium fluoride and fluorosilicates in those rocks. These fluoride ions are to what is commonly referred as being “naturally occurring” fluoride. When fluorosilic acid is added to drinking water, due to the pH of that water, the FSA immediately and completely hydrolyzes (dissociates) into fluoride ions identical to those “naturally occurring” fluoride ions, and trace contaminants in amounts far below EPA mandated maximum levels of safety. After this point, FSA no longer exists in that water. It does not reach the tap. It is not ingested. It is of no concern, whatsoever. A fluoride ion is a fluoride ion, regardless the source compound. Elementary chemistry. There is no valid, peer-reviewed scientific evidence of any adverse effects of optimally fluoridated water on minorities, or anyone else. There is however, clearly documented evidence of the lifetimes of extreme pain, debilitation, black discoloration and loss of teeth, development of serious medical conditions, and life-threatening infection, directly resultant of untreated dental decay which can be, and is, prevented by water fluoridation. A. There are well over 100 of the most highly respected science and healthcare organizations in the world which fully support water fluoridation. There could not be any clearer demonstration of scientific consensus than there is in support of this initiative. B. There are myriad reasons why other countries may not fluoridate their water. These reasons include logistics of water supplies rendering fluoridation cost-prohibitive, fluoridated salt and milk programs, existing fluoride levels already at or above the optimal level, readily available dental care for all citizens of a country, and many others. “Health and environmental concerns” play no role in these decisions. The cessation of fluoridation in Israel was due solely to the misguided action of one, single individual, the recently appointed Minister of Health, Gael German. Unfortunately, the Israeli system accorded Minister German, a long-time antifluoridationist dating back to her days as mayor of an Israeli community, the authority to do so. Minister German’s decision directly contravened the recommendations of her own, respected Israeli healthcare community, the very ones who best understand the healthcare needs of the citizens of that country. The Israeli healthcare community vehemently fought Minister German on her decision right up until the deadline of enactment. Even Prime Minister Netanyahu, himself, disagreed with Minister German’s action. Currently, the Israeli healthcare community has Minister German in court over her unilateral action, in the expectation that the High Court will reverse this grievous decision. A. There is not one, single respected organization in the world which opposes water fluoridation. That different countries may not fluoridate their water systems is not an indication that they “oppose fluoridation”. These reasons are myriad and diverse, as I have explained above. B. As stated above the overwhelming consensus opinion in support of fluoridation by the worldwide community of science and healthcare……could not be any clearer. The “Precautionary Principle” requires that there be no scientific consensus that an initiative is safe. Given the clear scientific consensus of the safety of fluoridation, obviously the “Precautionary Principle” does not apply. Rick North has no qualifications or credentials which would, in any manner, accord credence to whatever opinion he may have on water fluoridation. If he had any understanding of fluoridation he would realize that the “dose” of fluoride in regard to fluoridation is anything but “uncontrolled”. Water is fluoridated at 0.7 mg/liter. Thus, for every liter of fluoridated water consumed, 0.7 mg fluoride is ingested. The CDC has estimated that of the total fluoride intake from all sources, 75% comes from water and beverages. The US Institute of Medicine has established 10 mg to be the daily upper limit if fluoride intake before adverse effects will occur, long or short term. A simple math equation demonstrates that before this upper limit could be attained, water toxicity would be the concern, not fluoride. Well, blogger Hart Noecker is certainly welcome to his personal opinion on the best “ways to achieve dental health”. However every major dental entity in the world disagrees with his “learned” assessment in this regard. Searching for your email address at: sslott1@me.com pulls up dozens of copy and paste jobs on a whole range of articles that seem to cheese you off. Thanks for chiming in. Interesting. Instead of addressing my complete debunking of his erroneous nonsense, Hart Noecker makes a lame attempt to discredit me, as if that alters the facts and evidence I’ve presented. Kind of reminds me of the type of response one could expect from an elementary school kid. Kind of hard to defend your opinions when they have no foundation in fact, isn’t it Hart? Ahhh, I see you are resorting to “moderation” a.k.a. censorship, of my comments. That speaks volumes about the lack of confidence you have in your claims, Hart. History is littered with the failures of those who have attempted censorship to further their ideology. Good luck with that tactic.